As a psychologist and -- frankly -- a human being with chronic pain, I know how every day can be a struggle when the pain seems like it will never end. It's so easy to fall into the trap of saying that your pain is killing you or that you're in constant pain 24/7. Chronic conditions are not just no fun, they want to rob us of joy and happiness, leaving only empty pain and suffering in their wake. When we struggle with the emotional suffering that accompanies physical pain, it only makes things worse and the pain gets magnified. We isolate and self-medicate. Our world fills with the white ducks of suffering and hopelessness. I want to help you. That's why I wrote my book of daily reflections and affirmations, Black Duck Moments Every Day. Each day offers us the gift of its presence, and we can greet it as an opportunity to empower ourselves with the skills of acceptance, compassion, flexibility, and gratitude. Applying these skills helps us change our perspective on our condition in subtle but profound ways: When we begin to notice the black ducks in our lives and savor our black duck moments, we discover that pain isn't interfering with the quality of our life nearly as much as it once did. We begin to engage in living again, and we do so with meaning and purpose despite pain. Here's what I believe. You are not your pain. You are not your thoughts. You are not your feelings. You are you and that means you don't need to be fixed. You are whole despite having been shattered. You are a gift to the world that offers you gifts in return. Open your eyes to all that you are beyond your physical limitations, and you will find your black duck moments every day! “Black Duck Moments Every Day is an inspirational source of light for those living with chronic pain who feel that they are often times living in the darkness. In such a beautiful and supportive way, Bruce F. Singer provides daily affirmations to help those suffering tap into and embrace their own happiness and see beyond their condition. BeeDee is the creation of Lisa Hurwitz. Be sure to visit her site to see more of her magical creations. 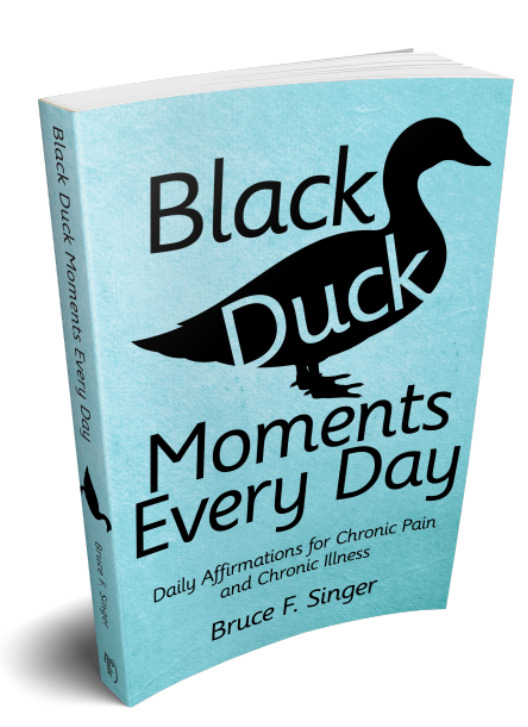 Bruce F. Singer is a psychologist, author of Black Duck Moments Every Day, and outspoken patient advocate whose compassion, humor, intelligence, and spirituality have helped empower thousands of people around the world recover from pain and addiction. Well-respected for his ability to make CBT, mindfulness, and acceptance and commitment therapy (ACT) accessible to all, he created and directed the Chronic Pain and Recovery Center at Silver Hill Hospital and served as Chief of Psychology at Crossroads Centre, Antigua. He sits on the Medical Advisory Board to the U.S. Pain Foundation and is a board member of Chronic Pain Anonymous. Bruce is the director and Chief Clinical Officer at Urban Recovery Center in Brooklyn, which is the premiere addiction residential treatment center in New York City. In addition, he works with PESI to train clinicians throughout the United States in understanding and treating complex chronic pain. Before becoming a psychologist, he was a successful Hollywood writer with many produced credits to his name. When not in Brooklyn, you may find Bruce out swimming or boating on Candlewood Lake where he lives with his wife Mary and their cat Marley down the road from Black Duck Farm. Our Facebook group, Black Duck Moments for Recovery, is dedicated to helping all of us who deal with pain, illness, substance abuse, and emotional issues to live happier and healthier lives by sharing those positive moments that exist all around us. We call our community Black Duck Farm, and we can all be farmers of black ducks!